What I learned from life is that a ‘principle’ is an expression of perfection, and we being imperfect beings cannot practice perfection, we devise every moment limits of its compromise in practice. We tend to lower our guard and principles down for the people we care for because there would be no purpose of principle if ‘people’ don’t exist. I have to accept THIS! I have to ignore THAT! —You’re forever having to tailor your emotions to the circumstances, you go easy on the people you love, you slip into your hundred little daily roles, you juggle, you balance, you weigh things up so as not to jeopardize the entire structure, because you yourself have a stake in it. In a social structure and individuality has its constraints’ and principles exist to be challenged. Compromising is a part of life. It’s supposed to be. It’s not something to regret. It’s something to aspire to. At the end of the day it’s not hard to decide what you want your life to be about. What’s hard, is figuring out what you’re willing to give up for the people you care about. 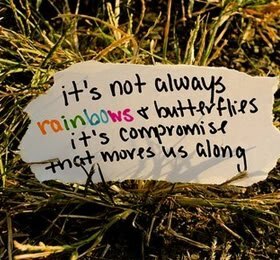 Compromise – It’s doing something for the other person, even when you don’t want to.